LAT: 12:28, no errors. Pretty stiff, had a hard time getting going on this one, but finally got through with no serious missteps. WSJ: 8:01, no errors. Far easier than I expected for Wednesday. Newsday: 10:05, no errors. New Yorker: 15:49, no errors. Again pretty smooth like Monday’s, and not a “try-hard” like Tuesday’s. 12/26/2018: In your explanation: Why did you refer to Pryor as the DAUGHTER??? Had to Google STEROL; from that came SPALLS. Way too hard for a Wed. puzzle I think. I might have gotten about 75% filled in. But even after seeing the answers, I just wasn’t on the same page with Poole. LAT: 7:39, no errors. Newsday: 6:23, no errors. WSJ: 7:51, no errors. Breezed through these last night in a tryptophan-induced coma, without so much as a misstep. New Yorker: 46:06 (much of it spent doing other things and/or waiting for inspiration to hit), three one-square errors at the intersections of sports and music references unfamiliar to me. Did it this morning (after the tryptophan wore off, I guess). Spalls was new for me too. Had “repots” before “reroot” which tripped me up for awhile. I believe the abbreviation for Austria is AUT, not AUS? I just got my iPad working after a week. 14 mins 10 for me and 2 errors. I wasn’t expecting this level of difficulty either. Learned SENESCES, EUDORA, SPALLS, GENO’S and STEROL, which is quite a bit for a Wednesday. Had to change Trump to TROLL, although I think I’m actually right! Also had to change REpOts to REROOT, just like Heidi. @Bill – The comments from Thelma and Joanne are correct. You have a slight typo in the Richard Pryor bio, referring to him as a daughter. Also, the abbreviation for Austria is in fact AUT, but this is a note to the constructor not to you. Happy Holidays everyone. I hope Santa brought you all what you hoped for! No errors, and I’m just glad I got out alive! 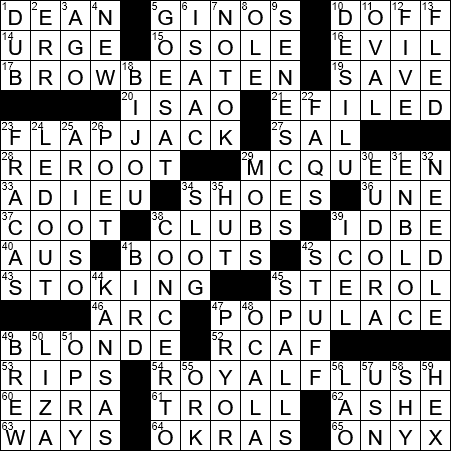 Fun challenge and a good puzzle, I thought, despite several words I didn’t know. SENESCES??? Wowza!😯 That word looked so weird that I thought sure I had it wrong, but I was confident in the crosses. Clever theme.